Grand Elder: Shaymin Get!! National Dex Complete! Shaymin Get!! National Dex Complete! 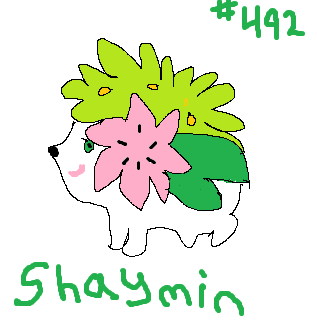 This week after many attempts I finally found someone who had a legit Shaymin, and was willing to trade it to me. After the Deoxys event in May, Shaymin was the last Pokemon I needed to have all 649, and officially complete my National Dex on my White version. For the past 4 months I asked friends, people online, and almost anyone I saw who seemed like the played Pokemon, if they had the legendary Pokemon. Sadly none of them had that specific Pokemon, but were pretty interested in my almost complete Pokedex. Pokemon I need to complete my Dex. Then the other day, after getting reacquainted with an old friend, he messaged me asking if I had a couple Pokemon he needed. Of course I did and was happy to help him out, but first I asked the simple question: "That depends, do you have a Shaymin?" He quickly responded with a yes, and soon the trades were made, and I finally had a Shaymin! Soon I will make an official celebration post with pictures of my Pokedex and maybe more celebratory drawings. If there are any suggestions on what I should post to celebrate feel free to give them!